SHAMROCK ROVERS SOARED back into the European spots with an efficient performance against a game Bray Wanderers side. Ronan Finn broke the deadlock late in the first half before goals from Dylan Watts (penalty) and Brandon Miele guaranteed all three points for Stephen Bradley’s side as they leap-frogged Waterford on the table. 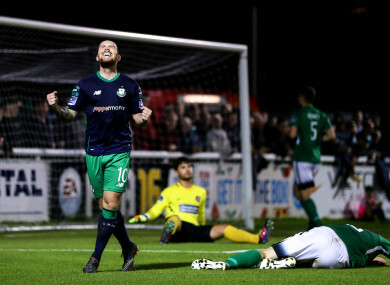 Just 72 hours after their superb victory in Oriel Park, the Hoops should have fallen behind in the 5th minute but Jake Kelly fluffed his lines when released by Kevin Lynch. It was a tepid performance from the visitors in the opening 45 minutes but their fans had something to cheer as Dan Carr brilliantly laid on the opener. Joel Coustrain’s ball forward was brilliantly chased down and won by Carr who then had the skill to evade Sean Heaney as he danced down the byline. He sent in a low cross which Finn appeared to nudge over the goalline. Rovers had the chance to possibly wrap things up right on the stroke of half-time when Miele’s corner found the head of Ethan Boyle but a goal-line clearance denied the Hoops right-back. Stephen Bradley’s side seemed intent on grabbing an assuring second goal and Coustrain almost landed it four minutes into the second period as his left-footed curler dropped narrowly wide. Roberto Lopes spurned a fantastic opportunity to make it 0-2 as he powered onto an out-swinging Miele corner but his header flew wide of the target. Sean Kavanagh would see a wicked free kick pushed behind by Moran but moments later the left-back burst into the box and was clipped by Darragh Gibbons to earn his side a penalty. Dylan Watts kept his cool from 12 yards. Moran would be beaten for a third time when Watts found Miele and he neatly turned inside the box before squeezing his low, left-footed shot beyond the despairing dive of Moran. BRAY WANDERERS: Evan Moran; Darragh Gibbons, Conor Kenna, Sean Heaney, Kevin Lynch; Sean Harding, Rhys Gorman, Paul O’Conor, Darragh Noone; Jake Kelly (Glen Holywood, 87); Ger Pender (Jake Ellis, 74). SHAMROCK ROVERS: Alan Mannus; Ethan Boyle, Roberto Lopes, Lee Grace, Sean Kavanagh; Greg Bolger; Joel Coustrain (Brandon Kavanagh, 73), Ronan Finn (Gary Shaw, 78), Dylan Watts, Brandon Miele; Dan Carr (Aaron Greene, 57). Email “Rovers climb back up to a European spot with a comprehensive win over Bray”. Feedback on “Rovers climb back up to a European spot with a comprehensive win over Bray”.